Scott Simon makes very nice ones for a good price. We liked his original design but naturally we wanted some modifications which he implemented in our guard. The guard is attached to the bumper only. This is why Scott reinforces the bumper and puts spacers in the gaps between the bumper and the mounts. Before the bumpers and bumper mounts were painted the brush guard was fitted and the required holes drilled (all part of what Scott delivers). Scott, you will never become rich if you don’t align the prices with your “competitors”! This brush guard not only serves optical purposes! 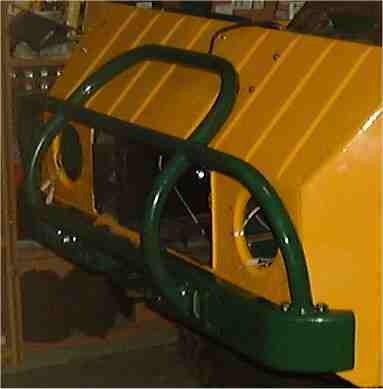 As Scott also reinforces the bumpers and the guard is made from strong tubing it also improves the chances in case of a frontal accident. Part of the brush guard add-on will be Hella Optilux 2020 lights. 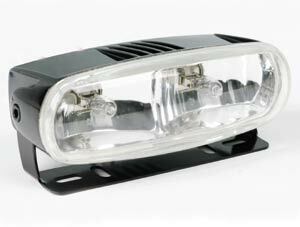 These are free-form lights, very small and contain a high- and fog-beam. The lights will be installed in the center below the bottom horizontal bar where Scott added some tabs for them.